The Shell Sunbeds, designed by Dutch designer Jan des Bouvrie, mix luxury modern European design with a retro feel and are available in a range of colours. High grade stainless steel and Batyline® fibre are modern materials with exceptional durability and are a classic option for relaxing and entertaining all year round in many outdoor spaces. 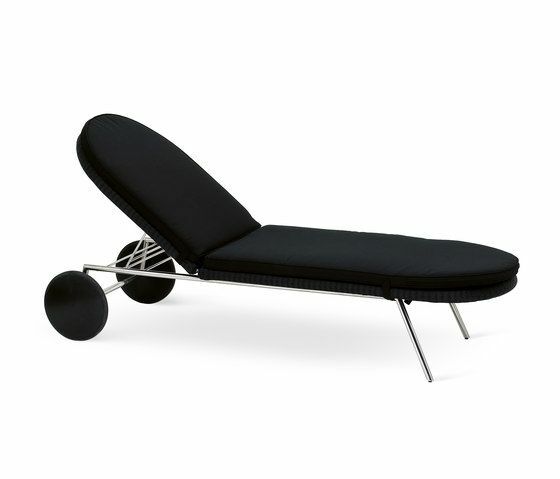 This superlatively comfortable lounger, with rounded shapes and a design reminiscent of mid-20th century styles, is fully adjustable, from completely flat all the way through to an upright reading position. The large aluminium and rubber wheels match the colour of the sunbed and enhance the great retro design. They also allow the lounger to be easily moved about. The frame of the Shell Sunbed is made of stainless steel with an electropolished finish and the seat is constructed in hand-woven Batyline® fibre, which is mold resistant and UV resistant. Coordinating cushions are available, carried out in Tempotest® fabric. This combination of materials makes the Shell collection ideal for outdoor use and resilient to even the harshest of marine environments. The Shell collection, has been specifically created for FueraDentro by the Dutch designer Jan des Bouvrie. The most notable characteristics of the Shell collection is the rounded shape of the shell-like cocoon seats, which brings a stunning and comforting sense of relaxation. The seats are made using a hand woven coaxial structured Batyline® fibre that is tactile, functional and will last. The frames are made of electro-polished stainless steel and the tabletops are glass. This combination of materials makes the Shell collection ideal for outdoor use. The inviting style of the Shell collection can be further enhanced with co-ordinating cushions.